The Brooklyn based multidisciplinary artist will exhibit a recent body of work at the Hammer, her first solo museum exhibition in Los Angeles. 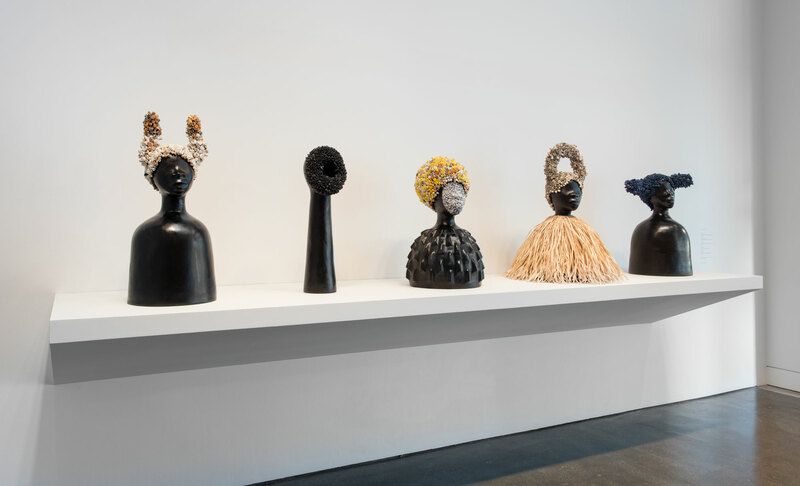 Working across ceramics, sculpture, video, installation, and social practice, Simone Leigh examines the construction of black female subjectivity and economies of self-preservation and exchange. Her practice is largely research based and intersectional, and considers a range of sources, including ethnography, feminist discourse, folklore, and histories of political resistance. 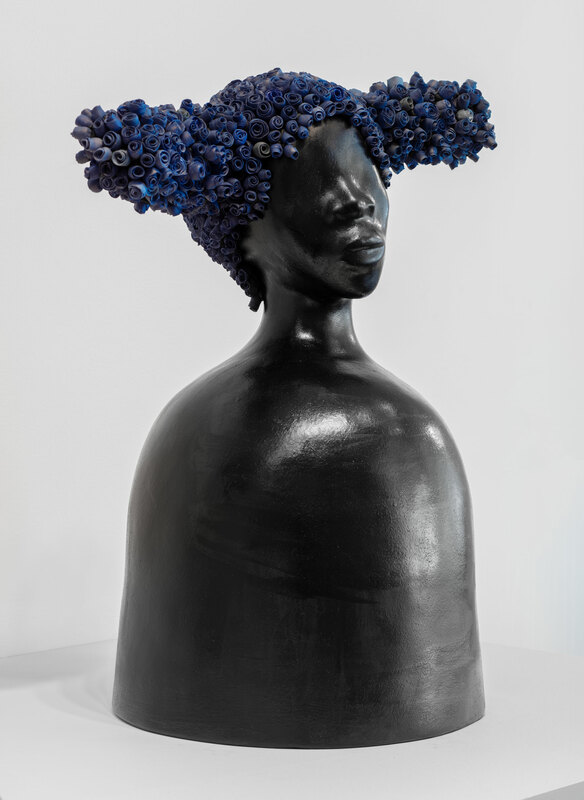 Working in ceramics, sculpture, video, installation, and social practice, Simone Leigh (b. 1967, Chicago) examines the construction of black female subjectivity and economies of preservation and exchange. Her practice is largely research based, and considers a range of sources, including ethnography, feminist discourse, folklore, and histories of political resistance. Leigh’s sculptural works in ceramic and other materials reference vernacular visual traditions from the Caribbean, the American South, and the African continent, as well as the black diasporic experience dating from the Middle Passage to the present. Vessels such as vases and urns, cowrie shells, huts, and busts are recurring forms, each making symbolic reference to the black female body. The repetition of shapes allows Leigh to have a sustained, temporal engagement with the formal—and gendered—history of ceramics and the cultural histories each object represents. In her essay “Women’s Time” (1981), the French theorist Julia Kristeva describes female subjectivity as providing “a specific measure that essentially retains repetition and eternity from among the multiple modalities of time known through the history of civilizations.”1 She says that identity is constructed in part by a subject’s orientation to time and history, and that the time of women operates not linearly, but more discursively. Kristeva’s formation of temporality is useful in considering the importance of repetition in Leigh’s work, but Leigh’s expanded concerns also involve the interstices of race, gender, and class. By centering black women as subjects and audience, Leigh forges her own sense of time that is constantly navigating various histories, while contending with the present and with possible futures. Leigh was born in the late 1960s, shortly after the minimalist moment in American art. Postminimalism (a term coined by art historian Robert Pincus-Witten while writing on the work of the American sculptor Eva Hesse) was emerging as anexpansive response to the austere, hyper-masculine materials and methods employed by mostly male artists who eschewed the symbolic in favor of literal, pure forms. One of the important developments of postminimalism was the resurgence of craft, often maligned as a “low” mode of art making, and the emergence of a diversity of artists (that is, artists of color, such as the California assemblagists, and female-identified artists) who brought personal experiences and politics to their creative practices. Art historian Lucy Lippard wrote at the time: “Certain elements—a central focus (often ‘empty,’ often circular or oval), parabolic baglike forms, obsessive line and detail, veiled strata, tactile or sensuous surfaces and forms, associative fragmentation, autobiographical emphasis, and so forth—are found far more often in the work of women than of men.”2 Leigh’s conflation of divergent sensibilities, histories, and artistic impulses fits into a respected lineage of artists who are oriented toward feminist and civil rights activist discourses, such as Faith Ringgold, Barbara Chase-Riboud, Noah Purifoy, and Miriam Schapiro, among others. But her global, contemporary context also enables her to treat history as porous, ripe for repeated engagement and scrutiny. The works in her ongoing Anatomy of Architecture series are ceramic busts that recall the aesthetics of African figurative sculpture. The deep black tone of their surfaces is a marked departure from the pale marble of portrait sculpture from European antiquity. The heads do not depict specific women, but can be any woman. The faces have broad, rounded noses and full lips, features often ascribed to African Americans. The eyes are smoothly modeled, giving way to flat and high foreheads. Each is outfitted with a spectacularly ornate headdress of small, delicately hand-formed porcelain roses, glazed in various shades of blue, gold, cream, and gray. 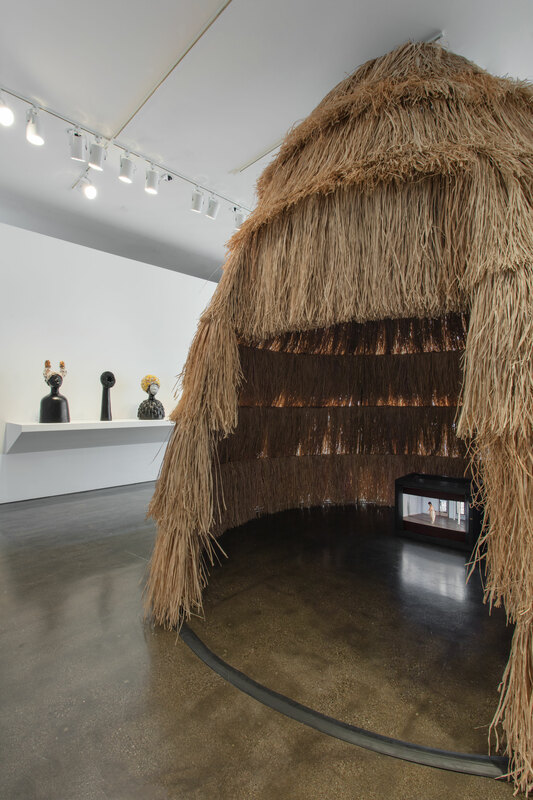 These heads, as well as her cowrie shell sculptures, entreat viewers to consider the body both literally and metaphorically. The shapes of Leigh’s sculptures—elongated and ovoid, sometimes adorned with the ceramic roses—invoke female anatomy, specifically the womb and external genitalia, asking “psychosexual questions about looking, giving, receiving, being.”3 Her oversize cowries also serve as a reminder of the involuntary movement of bodies during the slave trade; attractive, though essentially worthless, the shells were used as currency in exchange for slaves. Leigh’s impressive body of work focusing on the bust and cowrie motifs is an impactful enunciation of the enduring power and primacy of black femininity. The sculptures are also inspired by Mammy’s Cupboard, a restaurant in Natchez, Mississippi, housed inside a hoop skirt worn by a smiling, kerchief-wearing, crudely painted black woman. A “mammy” is an egregious stereotypical representation of black womanhood with roots in the antebellum American South, usually characterized as a maternal figure responsible for the care of her master/boss’s (white) children.5 Leigh’s recuperation of this reference, and her appropriation of a particular form of vernacular architecture, posits another way in which bodies, particularly black bodies, inhabit space, both cultural and physical. Particularly at this moment in the United States, where the mere act of #walkingwhileBlack or being on one’s own property can be perceived as a threat, punishable by harm or death, thinking of space—public or private—as safe and restorative, to be democratically occupied and moved through, created for and by black people, is a radical gesture. 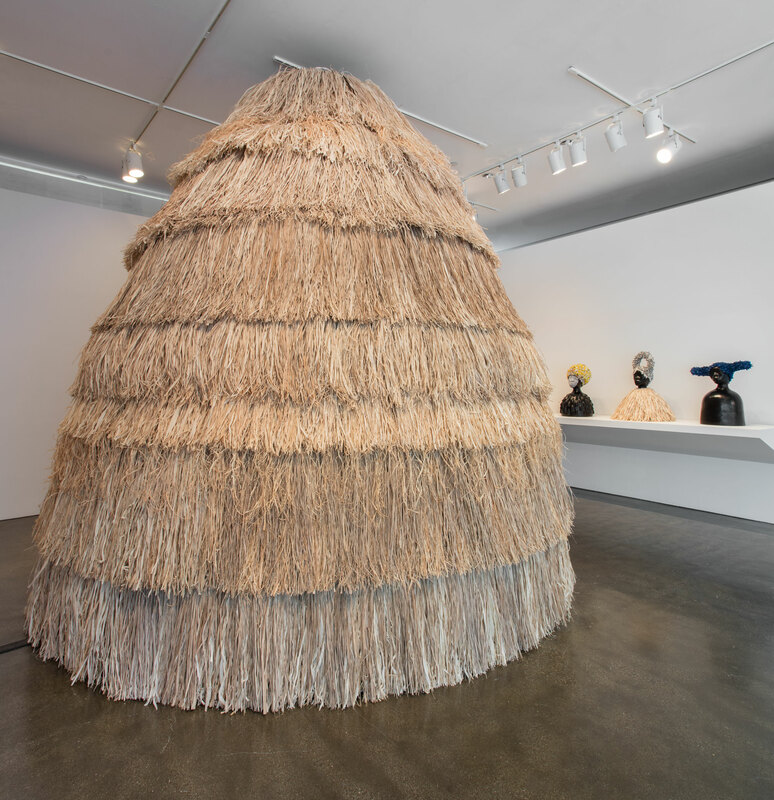 Simone Leigh’s sculpture, as well as her recent social practice–related work, such as The Free People’s Medical Clinic (2014) and The Waiting Room (2016), locates experiential activities geared toward communities of color within museums and art galleries, which are sometimes viewed as elitist by the general public. The projects make space for “others” within the culturally charged space of the “institution.” Inspired by the outreach work of the Black Panther Party focused on illiteracy, poverty, and hunger; feminist consciousness raising; and radical self-care initiatives, these projects take a holistic approach to self-preservation, thus preserving people and culture for posterity. This notion also extends to objects and images, the creation of which is Leigh’s primary domain. Her work functions as an act of care for the politics of representation. The constant iteration of certain forms and imagery is a mode of abstraction that calls into question how time progresses, how history is written; yet the gendered, cultural body remains a constant, an anchor for her artistic vacillations. Leigh’s commitment to experimentation with traditional forms, and her embedding of a multiplicity of historical, social, and cultural references into her work, under-scores the necessity of reaching across multiple continuums in order to make an art that is truly by the people and for the people. 1. Julia Kristeva, “Women’s Time,” Signs 7, no. 1 (Autumn 1981): 14. 2. Lucy Lippard, “The Women Artists’ Movement—What’s Next?,” in From the Center: Feminist Essays on Women’s Art (New York: E. P. Dutton and Co., 1976), 143–44. 3. Malik Gaines, “Artists on Artists: Simone Leigh,” BOMB, no. 127 (Spring 2014), bombmagazine.org/article/10033/simone-leigh. 4. Elizabeth Weatherford, “Women’s Traditional Architecture,” Heresies 1, no. 2 (May 1977): 36, heresiesfilmproject.org/wp-content/uploads/2011/09/heresies2.pdf. 5. The African American actress Hattie McDaniel famously immortalized the type in Gone with the Wind (1939), a role for which she was awarded an Oscar, the first ever won by an African American; the honor must have been bittersweet. 6. bell hooks, “Architecture in Black Life: Talking with Laverne Wells-Bowie,” in Art on My Mind: Visual Politics (New York: The New Press, 1995), 155–56.